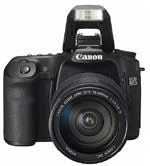 Canon has introduced their new EOS-50D digital SLR, which has been the subject of rumors for the last several days. Since we're under a non-disclosure agreement, we've been unable to publish anything until now. Since Canon (as usual) didn't provide any specs, press releases, or product photos in advance, I'll be updating these news items frequently tonight, so check back often. It's pretty frustrating that those of us who sign and honor non-disclosure agreements are not given information ahead of time, only to watch Canon leak the information themself, and allow it to proliferate across the Internet. Here are the details on the new EOS-50D. By the way, the 40D isn't going anywhere -- it'll slot in-between the Rebel XSi and the 50D.